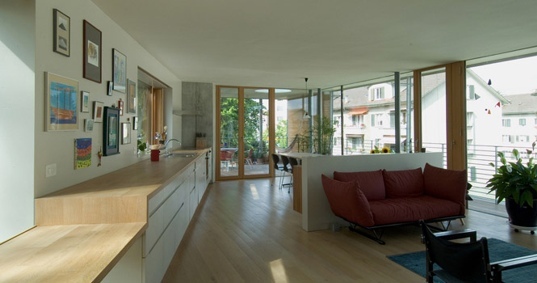 The winner of the 2010 Passivhaus Architecture Award is a fantastic three-apartment building on the outskirts of Bern, Switzerland. Built by architect Peter Schurch, principle of Halle 52, the building breaks the mold for passive house design by incorporating a lot of glass — over 50% of the facade — yet it still achieves a strict 13kWr per sq meter of energy consumption a year. Natural and local materials, plenty of daylight and a unique footprint made the award a shoe in — the building even cost less to build than the other homes in the neighborhood, yet it has r-52 walls and a solar-electric green roof. The three nearly identical apartments are graced with an abundance of natural light thanks to a bank of triple-paned windows adjacent to the walkout porches. The architect added some nice sustainable touches like a green roof ribbed with solar electric panels, a pellet boiler for heating the floors and hot water, and wooden shades on the outside of the porch to reduce the summer heat. The apartment building also received the Minergie (minimal energie) certification, which is a Swiss low-energy standard much stricter than its American counterpart LEED. The pie-shaped footprint is a departure from typical passivhaus building, which allows for an almost solarium effect on one side of the building and a generously wide living space on the other. The framing and interior wood cladding is from local forests, and air quality is taken care of by a careful selection of finishes and a heat recovery ventilator — the heart of passivhaus design. This well rounded and thoughtful design provides ample evidence that good green building is attainable and affordable if we set our mind to it. You can also read about our coverage of the second place award-winning Passive House Japan. 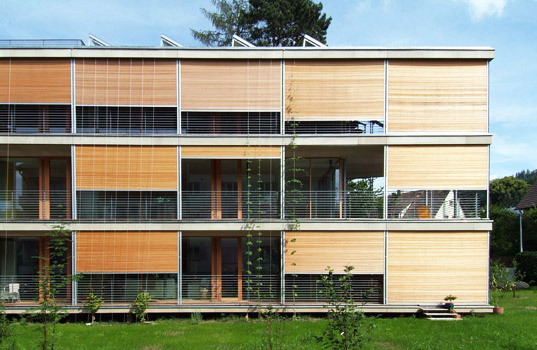 The winner of the 2010 Passivhaus Architecture Award is a fantastic three-apartment building on the outskirts of Bern, Switzerland. Built by architect Peter Schurch, principle of Halle 52, the building breaks the mold for passive house design by incorporating a lot of glass -- over 50% of the facade -- yet it still achieves a strict 13kWr per sq meter of energy consumption a year. Natural and local materials, plenty of daylight and a unique footprint made the award a shoe in -- the building even cost less to build than the other homes in the neighborhood, yet it has r-52 walls and a solar-electric green roof.